Cupcakes. I'm not much of a cupcake maker. I mean, when I want to make some for my kids' birthdays, I'll just buy the boxed stuff. I know, I know. Most other things I'm all about making it from scratch, but Betty Crocker and the Pillsbury Dough Boy make it so easy. I've been asked, though, to make desserts for a friend's wedding. I can't make box cupcakes for that, so I went to my trusted KingArthurFlour.com and got this recipe. I don't use the King Arthur Cake Flour, believe it or not. I just use the Swan's Down stuff. I also changed it up by adding the LorAnn Princess Cake and Cookie Emulsion because of its slightly lemony flavor. I like it, and I hope Anna does too. These cupcakes have a nice crumb, but aren't too delicate. They're almost spongecakey, but not quite. 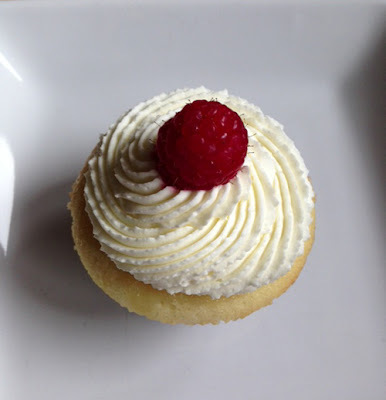 The sweetness of the cupcake, the white chocolate, and raspberry jam are nicely balanced by the mascarpone and whipped cream frosting. Even though I'm not normally a fan of the "white chocolate-raspberry" cliche, I'm good with this cupcake. I've "tested" about three or four of them so far, so it's safe to say that I really like them. Please note that one recipe of the mascarpone frosting isn't quite enough if you like a large amount of frosting on your cupcakes. This frosting is barely sweet, so it's nice to load these up. For the wedding I'll be making like 200 of these, so I'll be making lots and lots of the frosting. Wish me luck. Preheat oven to 350 degrees Fahrenheit. Line 24-26 muffin cups with cupcake liners. In the bowl of a standing mixer fitted with a whisk attachment, mix all of the dry ingredients on low speed. Add the soft butter and mix until it all looks like wet sand. Add the egg whites, one at a time, and then the whole eggs, one at a time, beating well after each addition. Scrape down the sides and bottom of the bowl after each addition. In a small bowl, whisk the milk with the vanilla and Princess Emulsion. Add this mixture, 1/3 at a time, to the batter. Beat 1-2 minutes after each addition, until fluffy. Scrape down sides and bottom of the bowl. Transfer batter to a large zip top bag. Carefully seal the top and twist a top corner so that the batter is forced into the opposite bottom corner. Cut about 1/2 inch off the corner. Squeeze batter into each muffin cup to within 1/2 inch of the top. Do not overfill. Break out another pan and put some liners in even if it's only for one or two extra cupcakes. Bake at 350 degrees for 17-20 minutes, or until a toothpick inserted in a center cupcake comes out clean. Remove from oven and allow to cool in the pan for a few minutes. Then with a butter knife or offset spatula, remove cupcakes to a wire rack to finish cooling. While cupcakes cool, prepare ganache (recipe below) and set aside to cool to room temperature. Prepare mascarpone frosting (recipe below) and then set in the refrigerator to wait. When cupcakes are cool, either cut an "x" in the middle, all the way down, or carefully cut a diagonal slice in the cupcake while keeping the paper intact. Place raspberry jam in a piping bag with a smallish tip. Pick up a cut cupcake and gently squeeze to open up the sliced area. Then squeeze a small amount of jam into the cut of each cupcake. Spoon about 1/2 to 3/4 teaspoon of cooled ganache onto the top of each cupcake. Pipe frosting onto the tops and top with a raspberry. *Now, in the spirit of full disclosure, I was only able to frost 18 cupcakes the way you see above. You'll have to either use less frosting to cover all of them, or make 1 1/2 recipes of the frosting to frost them all. Keep refrigerated until 30-45 minutes before serving. Place white chocolate in a heat-proof bowl. Heat cream in a small saucepan until it comes to a simmer. Pour hot cream over white chocolate and stir until chocolate is completely melted. Allow ganache to come to room temperature before assembling cupcakes. In the bowl of a standing mixer fitted with a whisk attachment, mix the mascarpone and sugar on high until completely blended. Add whipping cream and mix on low until cream is mostly incorporated into the cheese/sugar mixture. Then whip on high until stiff peaks form. Transfer to a piping bag fitted with your favorite cupcake frosting tip. Would I be able to taste the grain of the granulated sugar in the frosting? The sugar does not cause graininess in this frosting. It's very creamy an smooth. Where is lorann princess cake & cookie emulsion available for purchase? I found it online but was wondering if you know of any stores that might carry it. I've seen it at Hobby Lobby. So try calling your local hobby and crafting stores that carry cake decorating supplies.